The N201-S03-BL Cat6 Gigabit Snagless Molded Slim UTP Patch Cable is perfect for connecting network components like printers, computers, copiers, routers, servers, modems and switches in high-density data centers. Designed for fast transmission and excellent signal quality, this three-foot blue cable ensures peak performance throughout your local area network (LAN).Manufactured from 28 AWG copper wire, the four-pair stranded UTP N201-S03-BL delivers speeds up to Cat6 Gigabit/1 Gbps. Protected by a PVC jacket, this cable is more than 38% smaller in diameter than standard Cat6 cable, which increases airflow in tight spaces and makes it easier to install around corners and through cable management panels. RJ45 male connectors guarantee an accurate signal transfer. The snagless design protects the locking tabs against being damaged or broken off during installation. Integral strain relief ensures the cable and connectors last a long time. 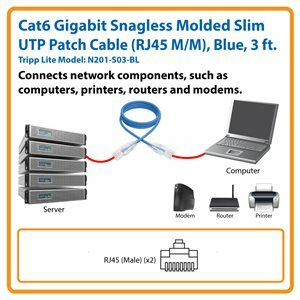 Cat6 Gigabit Snagless Molded Slim UTP Patch Cable (RJ45 M/M), Blue, 3 ft.
Tripp Lite’s N201-S03-BL cable is perfect for connecting network components like printers, computers, copiers, routers, servers, modems and switches in high-density data centers. Designed for fast transmission and excellent signal quality, this three-foot blue cable ensures peak performance throughout your local area network (LAN). Protected by a PVC jacket, the N201-S03-BL is more than 38% smaller in diameter than standard Cat6 cable, which increases airflow in tight spaces and makes it easier to install around corners and through cable management panels. Manufactured from 28 AWG copper wire, the four-pair stranded UTP N201-S03-BL delivers speeds up to Cat6 Gigabit/1 Gbps. RJ45 male connectors guarantee an accurate signal transfer. The snagless design protects the locking tabs against being damaged or broken off during installation. Integral strain relief ensures the cable and connectors last a long time. The N201-S03-BL comes with a lifetime warranty. It’s manufactured in compliance with strict RoHS specifications, reflecting Tripp Lite’s commitment to environmental responsibility. N201-S03-BL Cat6 Gigabit Snagless Molded Slim UTP Patch Cable (M/M), 3 ft.